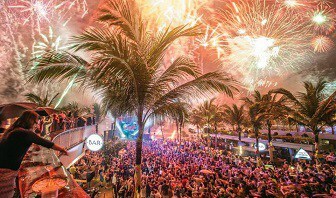 Celebrating the New Year in Bali among the famous Bali beaches clubs, nightclubs, bars, and rooftops. These places allow you to make your way into the new year in different ways. You can party hard until countdown begins, or even stay up late at most beach clubs. It is another reason going to Bali for New Year’s Eve. 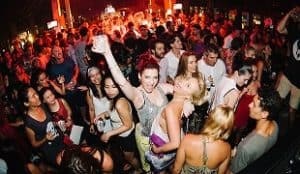 If you are looking for a high energy best party places all the way to the new years by the sea. Going to one of these beach clubs is the answers. Canggu has most uplifting beach clubs. Among them are Finn’s Beach Club and Echo Beach Club. 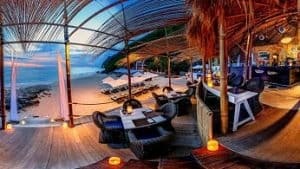 Another city in Bali that has great beach clubs are Seminyak areas. The most crowded one is the Potato Head Beach Club that is very active in social media and promoting various events. Other clubs also offers amazing New years Party such as W Bali, and Ku De Ta that worth checking into. Traditional Bali food is very fresh and authentic. If you are looking for a sit-down party entering the new years that Restaurant Party is an option to be considered. You can have a nice dinner with friends or family is one of this restaurant. Bali has many restaurant that serve different kind of food. They also serves great end of years party for their customers. Check out restaurant in Motel Mexicola, LaFavela or Old Man’s restaurant for their up and coming events. It takes New Years Party to another level. Any rooftop space attracts an upmarket crowd with the best view of the night starts. 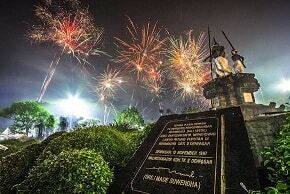 It is also a great way to spend the New Year Eve, where you have unlimited view of fireworks and the colorful sky. The most go to place for a rooftop party is the Double Six Rooftop on the top of Double Six hotel. You can lounge away while enjoying spectacular 180-degree views over Seminyak’s coastline and sunsets. The bar is one of the most coveted spaces at Double-Six Rooftop as it offers the very best views. Best parties are usually at the night clubs. Bali has numerous nightclubs that open all night long, even offer a 2-night event to welcome the new year. The SkyDome Super Club a part of the 61 Legian Entertainment Complex, is the main nightlife hotspot in Legian. Party goers go after can experience all-you-can-eat buffets with large clubbing space with high ceilings with amazing sound systems enhance with special laser spectrum lighting effects and a 100sqm LED screen. There are many clubs that offer great music and even invite famous DJ just to celebrate the New Year Eve. 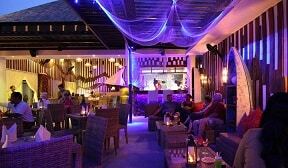 One of them is Club Jenja Bali in Seminyak with ultra-stylish interiors spread out over its two floors. You can party dan dance in the dance floor or enjoy much light food and drinks in the bar. This venue is for the laid back people. Those who prefer to spend the night with the burning charcoals barbeques and great conversations. Much of the place that does this kind of New Years Party style is La Plancha, a thriving cafe on Mesari Beach at Seminyak. Living up to their name, La Plancha (literally ‘the grill’) serves a variety of barbecued delights. You can actually days and night here, with amazing beach, wide playground for kids. It is suitable for a night with family. If you’re traveling with family, celebrating New Year Eve at your hotel will be the perfect spot. Hotels in Bali always have something special throughout the festive season, particularly around New Year Eve. There are gala dinners and parties, and it’s a good thing to check what your hotel has in the schedule before booking. Some hotels like The Mulia Bali feature international guest stars in their grand ballroom or the W Bali in Seminyak invites world-class DJs performing at their W Lounge. Bali has many amazing pools and of course, much of them are the best place to have fun through the years. You can check out Ulu Cliff-house a brand new pool entertainment in Bali. It offers great pools with amazing scenery of the sea. There are many Balinese clubs in Bali with a rustic touch. You can have a much with the light breezy tropical theme. Azul beach Club with their famous bamboo tree feature by the beach is a great place to spend the night. They offer an elegant and classic celebration all night long with music and International musician. Potato-Head had also named as the most famous club by tourists in Bali. This club and its headquarters in Bali are always crowded by locals as well as tourists who are looking to have a good time. This park is located near the biggest market of Bali, Pasar Badung, right in the center of Denpasar city. You can enjoy New Year’s Eve like the locals here. There are many peaceful yoga centers in Bali. They also offer The New Year’s celebrations such as psychic readings, a letter-burning ritual, chakra rebalancing and traditional blessings for new beginnings. Places like Marco Della Valle and Yoga Suci Ritual serves more relax celebration. 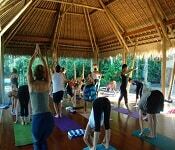 For tourists who had the routine of doing yoga at their hometown should come to Bali yoga center. Besides making new friends, it’s fun to practice some yoga poses with the locals. 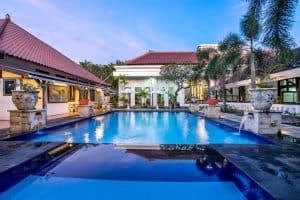 The city of Sanur is another option to consider. It has calm sea-front gets animated as tourists and locals meet on the beach to witness wonderful fireworks going on all night long. Bali capital of arts and culture turns into a party town for one night and there are shows and entertainment on the streets. Hanging out in Ubud you will see various the festivities with live music, traditional dances and gamelanperformances. Jimbaran beach is a great option for couples or families looking to spend the last hours in luxurious fashion. Jimbaran is famous with their seafood and you can reserve a table among numerous restaurant in Jimbaran to enjoy a full seaside ambience. 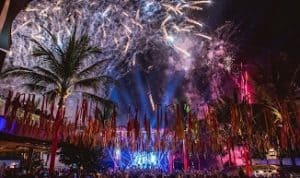 Those are the list of 14 best places in Bali for tourists spending New Years Eve Together. Amazing, isn’t it? Whether you are looking to share this special moment with the rest of the world or rather spend it privately with your loved ones. Bali will allow you to end the years the way you like while enjoying its wonders. Only in Bali can you decide to spend New Year’s Eve on top of a volcano or on a party boat, in a remote village or in the busiest nightclubs. Whatever suits your fantasy is available in the Island of thousand Gods.